You'll never guess where it happened. My Sunday School class is more like a book discussion group. We read a book together and discuss one chapter each Sunday. It's led by our pastor and his wife, and they choose books that really push my thinking about God and what He does and does not do. Three weeks ago, we read a chapter on prayer. The main point of the chapter was that when we pray, we should be listening instead of talking. The author explained that God already knows what's on our hearts, so our telling Him is more for us than for Him. So we're supposed to listen. Have you ever tried to listen instead of talking during your prayer time? For the last three weeks, I've prayed more or less the same thing. You already know what's on my heart. I am so blessed, and I thank you for my beautiful daughters and my handsome husband, and my mom and dad and sisters and Devin and Old Grandma and Nana and PopPop. Please forgive my sins (if I can think of any, I confess them, but I always say that just in case. You can't be too careful with these things). And now, Lord, I want to come into Your presence and hear whatever it is You want me to know. Change me, Lord. I'm ready to do whatever it is that You want me to do. And then my mind starts to wander, to a snoring child or a purring cat or nagging memory or a blog post needing to escape my brain. It wanders awhile, and I remember my mission. Sorry about that, Lord. I'm back in Your presence now, and I'm listening. Inevitably, my mind wanders off again. No matter how hard I try, I just can't stay focused on listening for the Lord's voice. Usually, I end up falling asleep. For three weeks, I've attempted this listening as prayer thing diligently. I've not heard a single word. Then I got really frustrated. I think God points out our sins to us so that we can confess them, and nothing was really popping up. I mean, there was a snarky thought here and a cross word there and a binge eating session, but I confessed those, repented, and promised to try harder. What could possibly be standing in the way of my hearing from the Lord? I kept at it. I prayed my nightly prayer, and then I waited. And my mind wandered. And then, in the middle of the evening, when I wasn't praying, He answered. And you know where He got my attention? It wasn't in my nightly quiet, mind-wandering prayer time. I'm not even kidding you. I opened my Facebook to write a quip about how I was surprised when I found myself wearing a necklace made of pop beads, and it turned into much more. In the previous 24 hours, there had been discussions and disagreements and plain old drama (that I may have partly caused by venting, I'm not sure) among my blogging peers. Ã‚ The specifics are unimportant, but a series of events led me to feel belittled and excluded. I was going to miss out on something fun, and I was disappointed. All day, the disappointment and feelings stewed. I said to myself (many times), “I need to just get over this.” But being the imperfect person I am, I couldn't get over it. As I began to type a status update about the necklace I'd forgotten I was wearing, the necklace that Gracie had fashioned around my neck at dinner, the hurt poured out. I'd had a fine day with the girls, cleaning up and playing, but I couldn't shake the dark cloud hanging over me. As I typed the last three sentences, “This tumult doesn't belong in my heart. My family and Jesus belong there. I'm done with the rest of the nonsense,” I had an epiphany. People drama, blogger drama, homeschooler drama, political drama, Girl Scout drama – none of this stuff belongs in my heart. Jesus belongs in my heart. My kids and my husband. My mother and father and Old Grandma and the rest of our family. My mother-in-law and father-in-law and the rest of their family. These are the things of my heart. After I hit post, I was struck by another epiphany. I have been praying for three weeks to hear God, to be changed by Him. He came at just the right moment, the moment when I was broken and needing help. He changed me, not in the way I'd imagined (um, rich! magnanimous! absent of sarcasm! ), but in the way that serves His plan. He made room enough for Jesus and a few people and a project. He met me where I live, not where I went to find Him. I guess to say that God spoke to me is misleading. I didn't hear a voice in the room. There was no thunder, no miracle, not even a whisper murmured. No words were spoken, but I understood the message loud and clear. Love this, (as one of the obnoxious people who say things that other people would rather not have to dwell on, I am reliably informed by a used-to-be-reader today). Probably I just need to leave the internet entirely. I don’t really know these people, and I seem to be screwing up their happy vibes right and left these days. That’s not how it works Cindy. It’s not that you need to get off the Internet. It’s that you need to ask God to push those toxic used-to-be-readers’ opinions right out of your heart. He has a purpose for you and for your blog. And also, sometimes people respond badly to the very things that they need to hear the most. Changing ourselves is never an easy or comfortable process. I know. I love you, too. May I never poke God in the eye. Ever. I love both of you and this post. And Tara – God loves you. He loves you even when you get caught up and your heart hurts because of drama. You know why – because that means you love others. That’s what he tells us to do. I can’t wait to see you next month and Cindy – you better not leave. I haven’t…and I’ve wanted to pull the plug so often…there shouldn’t be a plug to pull. Here’s the thing – God uses our words – He gave you both a gift. It’s hard – and the evil one wants us to quit. Then, he succeeds – one less person sharing the light in the dark…this dark internet where lies, whispers and gossip spread like wildfire. I love you both…. this post – it’s beautiful! I got goosebumps reading this. Thank you for sharing. I’m so glad it’s not just me who prays like that. It IS hard to try to keep focused while I pray. Too much spinning in my head. Good thing He loves us anyway. Thank you for blessing me today! Well said! I think he also “speaks” to us with a calm, warm feeling in our hearts when we pray. That is always a comfort to me that I have been heard. I really appreciate your thoughts! That’s sort of what I was waiting for. Something, not necessarily a voice. I had a big old nothing. I’m an immediate gratification kind of girl, too, so waiting three weeks. !!! 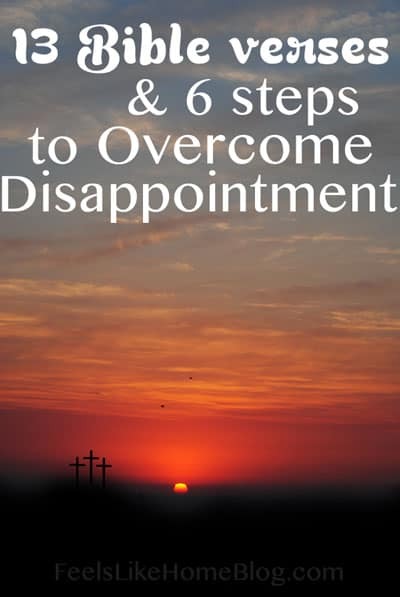 I just want you to know that I discovered you blog this week when I googled “how to deal with disappointment”. I have been reading your blogs this week and they are the only thing, besides Jesus, that have brought me any comfort. Your blog about jury duty hit home. I am praying for that man that God will make something good in his life out of the injustice that he suffered. Thank you so much for your kind words. I too am praying for that man and his family.